We've got some great events coming up. We hope you plan on spending some of the new year here at the library. We are delighted to welcome back Glenny Brock. Glenny has been a writer and editor for Birmingham Weekly and Weld for Birmingham and will be sharing her knowledge and tools of the trade with us. 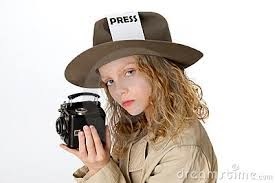 Do you have what it takes to be a reporter? Step 1: Read a Newbery book. ANY Newbery book. Step 2: Pick one of the Book Club meetings. Step 3: Come talk about books with us and eat delicious pie! For more information check out the club's webpage. Please email or call me at 205.439.5504 if you have ANY questions. Are you a Smart Cookie? Join the North Shelby Library's Smart Cookie Club this winter! Pick up a membership card at the childrens department's desk and every time you come to the library to check out books through the months of December and January get your card stamped AND add a sticker to our cookie jar bulletin board. Help us fill up the jar and show everyone how many Smart Cookies we have here at North Shelby. Everyone who participates is invited to our Smart Cookie Party in February! Join us for stories, groovy crafts, games and snacks. The library will be closed Monday, Jan. 19. for Martin Luther King, Jr. Day. To register for any events you can email, call (205-439-5504), or sign up online by clicking here: North Shelby Calendar.